If you missed out on Kraken, this could be another information arbitrage opportunity. In March 2017 I wrote a rather scathing analysis of the marijuana industry’s valuations, using Canopy in particular as an example. At the time, Canopy was trading around $10. It soon tumbled 30%, but if you have followed the industry at all, you know that I now look like a fool as it now hovers just under $70. The recreational market didn’t and still doesn’t exist; demand is far from certain. The laws surrounding the industry were not defined; it was not clear whether any particular company would be able to gain a competitive advantage. At such a high premium, if there was a stock market crash, investors could have easily lost 90%+ of their initial investment (at least on paper); and many investors have lost money in pot stocks because they don’t have enough conviction in the companies. This breaks Buffett’s Rule #1: Don’t lose money. I still am anticipating a significant bubble-popping experience in the industry when it becomes apparent that demand for many companies’ products is not there. That being said, Canopy Growth is an excellently run company. Their CEO, Bruce Linton, is incredibly frugal and hasn’t participated in any of these crazy acquisition sprees that others have, an indication that he’s an above-average capital allocator. Canopy is clearly the dominant player, as seen by Constellation Brands’ backing, twice. They are prepared to be the leading player GLOBALLY, not just in Canada. If bought at the right price, investing in Canopy could be a very worthwhile investment. Determining an appropriate price though, is near impossible without any idea of market demand. As an aside, I feel obliged to disclaim my potentially conflicting bias, as I am ethically opposed to investing in marijuana producers (likewise for tobacco, alcohol, and gaming companies). That being said, if I thought Canopy was trading at a reasonable valuation, I would indicate so. Alternative histories was this idea that the reality which plays out in our lives is not the only possible outcome. There are substitute courses of events that also could have occurred, but didn’t – simply by chance. It made me think about how if someone repeatedly made the same decisions over and over; what possible outcomes could have occurred? What would their lives look like in all alternative histories? What’s interesting about this intellectual framework is it forces you to not look at how things are, but also how they could have been. For example, I became obsessed with analyzing the track record of investment legends to determine if they were lucky or good. What happens to Soros track record if the British Pound doesn’t collapse? What happens to David Einhorn if he didn’t earn 100x on a small investment in an internet stock just prior to the tech bubble? What happens to Bill Ackman’s record without General Growth Properties? Were these good ideas… or just good outcomes? Did they take on too much risk and just barely avoid disasters? Perhaps some legends aren’t as good as we think and just were fortunate that the path that was actualized was in their favor. If they made the same decisions over and over across 1,000 different lifetimes…what would their lives have looked like across all 1,000? In this life they may be famous, but if they behaved the same way perhaps 999 times out of 1,000 they don’t succeed. Or, conversely, who produced average due to bad luck, but had world class decision making? Overall, I think this framework really made me think critically about decision making. Additionally, this shifted my priority from wanting to have the best performance to being the best investor. These are very different things. The best performance will be whoever is fortunate enough to have a path actualized that combined both risk and luck. The best investor would be whoever makes the best decisions considering all possible alternative histories.Maximizing the results across all possible alternative histories is something that is very important to me. And I also very carefully think about my own investment performance. Was the decision making that led to the results well founded? What other histories could have been actualized? Did you succeed, but did something stupid? Are you lucky or good? These are really tough questions – and Taleb got me to think about these types of things constantly. The idea of information arbitrage flies in the face of the efficient-market hypothesis. I do believe that the market is HIGHLY efficient for very popular, often large, companies. But even then, there are exceptions. For example, I think that investors have misinterpreted information provided by Facebook’s CFO, leading to what I believe is undervaluation of a VERY well-known company. We will find out next quarter. Information arbitrage is even more common in micro- and nano-caps. As we saw with Kraken, the CEO, Karl Kenny, emphasized that he expected revenue to more than double this year, yet the market didn’t react until they “officially” won those contracts. That being said, I don’t think the upside is over. I believe that they are currently experiencing what I call “The Snowball Effect” (I’m sure I’m not the first). More and more companies are seeing that their technology is proven, and that they have great support from a large partner, leading to more and more contracts, leading to further support, leading to… You get the point. Before I get started, once again, I did not originate this idea (in fact, out of the 20ish companies in my portfolio, only GDNP and MRC are companies I discovered on my own). This idea came from a contributor named Thomas Birnie in the Capital Compounders FB group. He actually shared EnWave (ENW) two months ago, and a conversation this weekend encouraged me to look at them again (it usually takes me a few times looking at a company before being convinced—also, the CEO changed within that time, which I’ll discuss at the end). Their technology is far superior than freeze or air drying in terms of efficiency and maintaining flavor and nutrients. They dehydrate everything from peppers, to spinach, to strawberries (Kellog’s Special K cereal anyone? ), meat (ie. bacon bits or jerky), and even pet food and vaccines (will discuss later). So what is EnWave’s history? Like Kraken, the technology was developed and the machines are manufactured in Canada (Southern B.C. for EnWave), so it’s another homegrown company worth supporting. And like Kraken, EnWave’s technology has been developing for a VERY long time, and I believe the market for it has only recently ripened. What is different is that EnWave is about 7x larger than Kraken was in market cap when we first discovered it. And even now, EnWave is double the market cap and triple the revenue of Kraken, with much more diversified business segments. It’s a licensing and royalty company. We sell the machines to major operators… and then after we sell the machine, we prescribe for them a market area and a product specification… They will pay us a royalty on the throughput of that machine… it lasts as long as our patent portfolio lasts. What differentiates us… [is that many royalty companies] have to put capital forward to secure a royalty. In this business we sell a machine for a profit, and we get a royalty as well. We’re going out and approaching all of the operators around the world, food operators, in all the countries on a variety of products, and our objective is to build a large portfolio–hundreds of machines– that will all send back royalties. But we’ll make those sales one sale at a time, although we anticipate once we sell a machine to a company… if and when their product works, they’ll order a second machine, and a third machine, and we’ll build up a portfolio that way. EnWave is also focused on facilitating the growth of NutraDried Food Company, LLC, our wholly-owned subsidiary and a key royalty partner. NutraDried is a significant driver of our improving financial performance. NutraDried’s success with Moon Cheese® is proof that REV™ technology can create value for our partners. It is also our mission to grow NutraDried into a world-class snack food company and to drive revenue growth using REV™. Moon Cheese is sold at Starbucks and Costcos across the U.S., as well as at Safeway, Loblaws, and Save-on-Foods in Canada (check it out, it looks delicious). To be completely honest, I saw their packages at a Starbucks in Idaho, but they were in an obscure location and it didn’t look like many people would see them. That being said, the results speak for themselves, with revenue growing 144% year-over-year! This division has MUCH higher margins (37% net margin last quarter) and is a significant profitability driver. EnWave’s machine sales continue to grow at a moderate pace. From 2014 to 2018 we continuously sold more REV™ machines year over year. This trend is anticipated to continue through 2019. To be clear, neither I nor my team will accept the status quo moving forward. Additional effort and resources have been allocated to sales, marketing and business development in the form of new hires, strategic marketing spends, increased international trade show attendance and more proactive business prospecting and travel. I anticipate to personally be away from my family for over ninety days this year in order to drive our business forward; as I write this letter I’m on a plane headed overseas. There are many others on our team that will be doing the same as we work toward achieving our mission. We recently expanded our engineering and manufacturing facility to prepare for this anticipated potential growth. Our business development team has been incredibly active pursuing additional royalty partners in the cannabis space. Tilray is our marquee royalty partner who has already purchased a pilot machine and two 60kW continuous lines. The first 60kW line is scheduled to come online later this calendar year and the second in the first half of 2019 in Portugal. EnWave’s focus is to partner with as many Canadian licensed producers as possible through a sublicensing structure, which has been agreed to by Tilray. [This means Tilray will get a portion of royalties as well]. EnWave personnel will lead the sublicensing negotiations and Tilray will provide their testimony to why REV™ is a game changer for the industry. Our goal is to become the standard for drying cannabis. EnWave is currently engaged in advanced dialogue with three major licensed producers and initial discussions with another nine. If you’ve been following the markets much, you may have heard of Tilray’s explosive stock growth in the U.S., 8-fold in about a month, being the first marijuana company to trade on the NASDAQ. You may have even been tempted to invest. This is where the information arbitrage comes into play. While Tilray only became public in July, they first initiated their pilot project with EnWave last October. They then ordered their first commercial machine in February, and second machine in April. It doesn’t seem that the market is paying much attention to EnWave at all. But now that Mr. Charleton has laid out this very clear plan to his shareholders, the market could catch on quickly. EnWave’s patented technology pasteurizes and uniformly dries cannabis in its natural state, without any additives, in under one hour, dramatically shortening the time from harvest to marketable products and circumvents the need to transport medical cannabis to highly-specialized and expensive off-site decontamination facilities. EnWave’s continuous high-volume REV™ drying process is energy efficient and eliminates the need for large-scale in-house drying rooms and the associated potential for product loss due to mold growth during the traditional multi-day drying process. The automation of the drying process by EnWave’s scalable REV™ machinery is expected to reduce personnel costs and provide a highly cost-effective solution for high-quality cannabis production. According to Mr. Charleton, studies have shown that their REV technology retains 100% of CBD and THC in marijuana, as well as it has a good retention of terpenes (AKA the aromatics), which he says “has been reviewed…favourably on smoking panels” (he says with a sly grin). Over the years I have witnessed the frustration of several shareholders pertaining to the opaqueness of many of our ongoing research agreements. Moving forward, EnWave executive management will try to be more transparent regarding ongoing projects, while abiding by our confidentiality requirements. It’s a difficult balancing act. There have been some significant wins this year including the signing of a commercial license with Arla Foods, the seventh largest dairy company in the world; selling a REV™ machine to the U.S. Army; and five other 10kW REV™ machine sales. To reiterate my previous statement, our business development pipeline is very healthy. There are several significant decisions to be made by both new potential commercial licensees and existing royalty partners regarding REV™ machinery purchases in the next three months. Expected, but not guaranteed, decisions could include Bonduelle, Agropur, a prospective cannabis partner and others. Also, in the next six months there are several current licensees that are required to place additional REV™ equipment purchase orders in order to retain their respective exclusivities. It should be a very busy next twelve months for our team. The successful recent completion of the Factory Acceptance Testing with Merck marks a significant milestone in the scaled-up commercialization of EnWave’s proprietary REV™ technology in the pharmaceutical sector. Following installation, the equipment will undergo site acceptance testing prior to potential processing of pharmaceutical products using the technology. This project maintains a longer term time horizon for us, as new vaccines must undergo rigorous clinical testing in the United States. That said, we still see long-term value for the company in pursuing the pharmaceutical sector in parallel to food and cannabis. Continuous processing of discrete dosage units of pharmaceutical products is sought by the pharmaceutical industry as it seeks more flexible and adaptable manufacturing processes. REV™ freeze drying provides a potential continuous drying platform to rapidly dry vaccines, monoclonal antibodies, therapeutic proteins, probiotics, enzymes, and small molecule therapeutics. Furthermore, the technology evaluation that is underway with GEA Lyophil, a major global supplier of GMP lyophilisation equipment, will include Merck’s participation. This broad collaboration could expedite the development process and create a quicker path to commercial production. Interest from other pharmaceutical companies has begun to surface again. Our business development efforts in the global food processing industry is beginning to pay off. Success begets success. EnWave has now signed eleven commercial licenses in the dairy vertical and eleven commercial licenses in the fruit and vegetable vertical. I hope to announce new commercial licenses in the meat snack vertical, amongst others, in fiscal 2019. I think it’s obvious that the snowball has already formed for EnWave. My goal is to catch it before it turns into an avalanche (or a “wave” you could say…). For the first time they generated positive cash flow in the quarter. They have no debt on their balance sheet, and $7M of cash. They would have been profitable in Q3 if it wasn’t for a one-time impairment due to an operation they ceased. One major risk is that one customer comprises 24% of their revenue, and three comprise 46%. Secondly, Mr. Charleton was just promoted to CEO not even a month ago due to “differences in corporate strategy and direction” with the former CEO. In my opinion, what I have seen so far has been all positive. 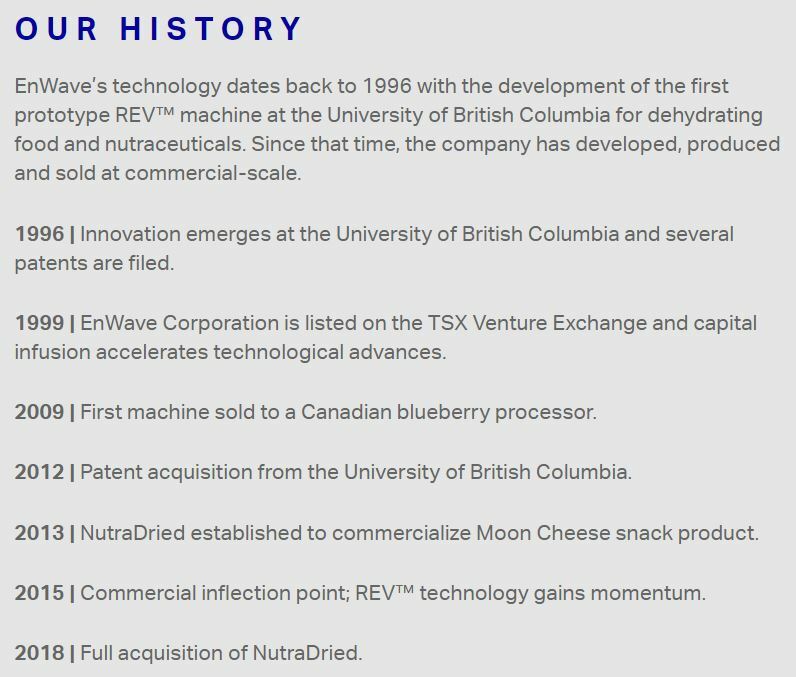 The former CEO, Dr. Tim Durance, was the co-inventor of REV and likely didn’t have the necessary business acumen to bring EnWave to the next level. And of course there is always the potential that a newer and better technology displaces EnWave’s REV technology. The reason I can sleep well with this risk is because EnWave is immensely diversified between industries (or at least is striving to). Particularly, the success of Moon Cheese is entirely independent of changes in technology. If it tastes good and is marketed well, people will buy. EnWave is currently trading at about 6x revenue. This is high (nothing compared to 150x+ for the rest of the marijuana industry), but given the above growth prospects, I am quite content buying and holding at these levels. With limited capital, my hand was forced. After much deliberation I decided to sell half of my position in Emera to fund a 4% position in EnWave. Emera is intended to be my pseudo-bond position. The whole intention is to fund more volatile investments when opportunities are presented, while still receiving a 5% dividend to wait for those opportunities. This is one of those opportunities. InvestorsFriend is not. I partnered with InvestorsFriend because many of my readers just wanted a professional to suggest EXACTLY what to invest in. InvestorsFriend has a 18-year track record of materially outperforming the index. Shawn Allen has the credentials and expertise to provide clear buy/sell recommendations.